According to Sir Thomas Malory's Morte d'Arthur, the fifteenth-century romance of the semi-mythical English king, Merlin the magician called the nobles together on Christmas Day for a sign as to who was their rightful king. There was a sword embedded in an anvil (or stone.) Whoever could draw it out would be king. All tried and failed. It was young Arthur, who knew nothing of the sword's significance, who finally succeeded. 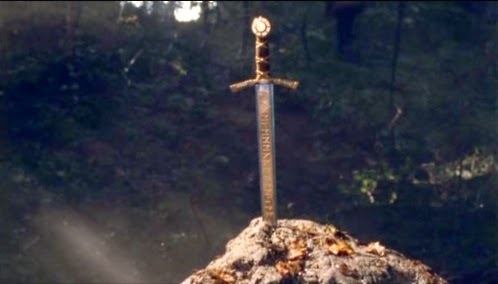 He was just trying to find a sword for his brother who'd left his own behind, and the sword in the stone seemed the handiest source.